​Betrayal of the Sinhalese by the Treacherous Perfidious Sinhalese Leadership. The joint opposition today urged President Maithripala Sirisena to take action against Foreign Affairs Minister Mangala Samaraweera whom it accused of violating the collective responsibility of the Cabinet. Joint opposition MP Dinesh Gunawardane told a media briefing held at parliamentary complex that Mr Samaraweera had challenged the President through his recent statement that the non-inclusion of foreign judges in the judicial mechanism to probe human rights violations was an opinion expressed by the President. “President is the head of the government and therefore has the power to appoint the cabinet. He announced the stand of the government with regard to foreign judges. However, the Minister expressed a different opinion and therefore it is a violation of collective responsibility of the Cabinet," he said. MP Dallas Alhaperuma who spoke about the shadow cabinet said its purpose of was to monitor the work of the minister. “Shadow cabinet is a common concept in politics but the shadow cabinet of ours is different as we will be monitoring the work of the ministers" he said. MP Bandula Gunawardhane who revealed the latest plans of the joint opposition with regard to VAT said a petition will be filled in courts against the VAT Amendment Bill which was presented in Parliament by Finance Minister Ravi Karunanayake last morning. "The government had actually bulldozed Parliament by increasing VAT even before the Bill was passed" he said. Sudath Gunasekara President Mahanuwara Sinhala Jestha Puravesiyange Sanvidhanaya 13. 7.2016. ​2.4 All persons who have been displaced due to ethnic violence or other reasons, will have the right to vote in such a referendum. Necessary conditions to enable them to return to areas from where they were displaced will be created. 2.9 The Emergency will be lifted in the Eastern and Northern Provinces by August 15, 1987. A cessation of hostilities will come into effect all over the Island within 48 hours of the signing of this Agreement. All arms presently held by Militant Groups will be surrendered in accordance with an agreed procedure to authorities to be designated by the government of Sri Lanka. Consequent to the cessation of hostilities and the surrender of arms by Militant Groups, the Army and other security personnel will be confined to barracks in camps as on 25th May 1987. The process of surrendering of arms and the confining of security personnel and moving back to barracks shall be completed within 72 hours of the cessation of hostilities coming into effect. ​2.18 The official language of Sri Lanka shall be Sinhala. Tamil and English will also be official languages. His Excellency the President of Sri Lanka and the Prime Minister of India agree that the referendum mentioned in paragraph 2 and its sub-paragraphs of the Agreement will be observed by a representative of the Election Commission of India to be invited by His Excellency the President of Sri Lanka. Similarly, both Heads of Government agree that the elections to the Provincial Council mentioned in paragraph 2.8 of the Agreement will be observed and all para military personnel will be withdrawn from the Eastern and Northern Provinces with a view to creating conditions conducive to fair elections to the Council. The President, in his discretion, shall absorb such para military forces, which came into being due to the ethnic violence, into the regular security forces of Sri Lanka. The President of Sri Lanka and the Prime Minister of India agree that the Tamil Militantsshall surrender their arms to authorities agreed upon to be designated by the President of Sri Lanka. The surrender shall take place in the presence of one senior representative each of the Sri Lanka Red Cross and the India Red Cross. The President of Sri Lanka and the Prime Minister of India agree that a Joint Indo Sri Lankan Observer Group consisting of qualified representatives of the government of Sri Lanka and the government of India would monitor the cessation of hostilities from 31 July 1987. The President of Sri Lanka and the Prime Minister of India also agree that in terms of paragraph 2.14 and paragraph 2.16 (C) of the Agreement, an Indian Peace Keeping Contingent may be invited by the President of Sri Lanka to guarantee and enforce the cessation of hostilities, if so required. India and Sri Lanka have agreed to set up a joint consultative mechanism to continuously review matters of common concern in the light of the objectives stated in para 1 and specifically to monitor the implementation of other matters contained in this letter. ​Kindly confirm, Excellency, that the above correctly sets out the Agreement reached between us. ​His Excellency, Mr.Rajiv Gandhi, Prime Minister of the Republic of India, New Delhi. This historic betrayal is not surprising when we read his strong words he used and views he held as a member of the National Congress as reported by Michael Roberts (1977) in his ‘Documents of the Ceylon National Congress 1929-1950 Vol (11) (Pp 2802-2803). “ A free Lanka , Independent of all other nations of the world, is difficult to conceive of. An Indo-Lanka Federation may have to be discussed, may even have to be planned for and may be useful for us to achieve,– our present political aspirations are out of date and must be replaced by new conceptions and a fresh outlook. India and Lanka must be one unit for the purpose of defense. In the Federal Legislature (Indian that he proposed), Lanka must be accorded a status equivalent to the status of the Indian Provinces. While this pronouncement he had made more than fifty years before 1987 clearly shows his stand and misconceived notion and underestimated potentialities regarding this country and it’s great people was it not exactly that dependent view he had put in to practice through the 1987 Indo Lanka Pact. d) Awarding Sri Lankan Citizenship to all Indian Estate Tamils right at the centre of the country, posing a fatal threat to Kandyan Peasants and the “Geographical Heartland” of this Island nation that determine and dictate the entire life system and the survival of the very civilization of the Island Nation, as it forms the source of all our rivers, by an affidavit signed on a one rupee stamp without any binding conditions to prevent them from being a threat to the natives and acting in any traitorous manner against this country and its native Sinhala people, thereby making Sri Lanka citizenship so cheap, perhaps the cheapest in the whole world. Isn’t it the completion of that historic betrayal initiated by his uncle Thambi Mudalyanselage Junious Richard Jayawardhana, that Ranil, his nephew, is going to do now at the behest of Chandrika, India and his Western Colonial masters of the Church, under the following agreement against all concerned patriotic Sri Lankans, both here and abroad, who are up in arms to protect their only 25,000 sq miles stretch of on this planet and their 2,500 old glorious civilization? ​Ranil wants SL to grow with ETCA, though he cites the Free Trade Agreements (FTAs) with China and Singapore are also on the sideline? Prime Minister Ranil Wickremesinghe yesterday drove home the point that Sri Lanka’s future lies in greater trade with the world and the Economic and Technological Cooperation Agreement (ETCA) with India and Free Trade Agreements (FTAs) with China and Singapore are being pursued with vigour. “Sri Lanka has always prospered in the past by trading with India. The ETCA will make Sri Lanka and the southern part of India the fastest growing subregion in the South Asia. Hence the ETCA is important and I want it to succeed,” the Premier said at the Annual General Meeting of the India CEO Forum Sri Lanka. While there is growing optimism in India over the impending ETCA, the Prime Minister also revealed that Sri Lanka was also going for Free Trade Agreements with China and Singapore while being on course to regain GSP+ covering the European Union. He told the India CEO Forum members that for South Asia to sustain high growth there must be structural changes in the economy and for Sri Lanka, that apart, greater international trade was necessary as it could not rely on domestic demand alone. This, he emphasised, was the basis for the ETCA with India as well as trade expansionary deals with several other countries. “We are keen to take full advantage of the geo-economic position of Sri Lanka. We will make Sri Lanka a hub or the centre for business in South Asia,” Wickremesinghe emphasised. “Sri Lanka has to join the global value chain to boost its manufacturing and services sector,” the Premier added. Towards achieving these goals, Wickremesinghe outlined plans and programs such as economic reforms, the doubling of investment in infrastructure, Logistics Hub, Megapolis, the International Finance Centre in Colombo Port City, the Southern Development Plan, the Kandy Development Plan and the Trincomalee Development Plan as well as a special focus on the North. Additionally, the Government will pursue fiscal consolidation, greater Public-Private Partnerships, the digitalisation of the economy, simplified taxation and new incentives to high employment-generating businesses. Guest of Honour, Indian High Commissioner Y.K. Sinha, said a fresh round of negotiations on ETCA would “commence soon” with a delegation from New Delhi coming over to Colombo. A fortnight ago Development Strategies and International Trade Minister Malik Samarawickrama held talks in India. “Indo-Lanka bilateral relations are sound but we can do a lot more to make it stronger,” he said, adding that since the signing of the FTA between the two countries bilateral trade has grown exponentially by 13 times to $ 5 billion. India CEO Forum Sri Lanka Founder President Sanjay Tiwari, who relinquished his post after serving for three years, said the 53-member professional organisation was committed to being a key part of Sri Lanka’s future development goals. 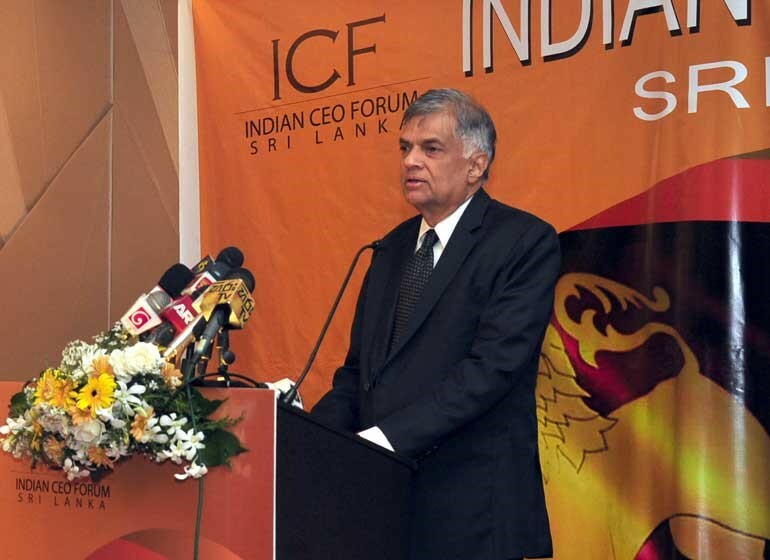 The India CEO Forum member firms’ investment in Sri Lanka is over $ 600 million, providing 18,600 jobs. ​Isn’t it a pity and a tragedy that these bunch of fools who cry for ETCA don’t realize that India has never been friendly towards Sri Lank throughout known history. All India’s actions and reactions have been and are primarily centered around self interest. Why cant our idiots realize this fundamental truth. What is more is already India has completely invaded this Island nation in all respects. Now look at the following list. They continue the dialogue with the estate Tamils and all other Tamils as people of Indian origin to destabilize the Sri Lankan Government. They rob our fisheries resources and insist that their fishermen be given rights to fish in our waters. Invade the whole economy, for example, Banking, service sector, labour market, transport inclidng monopoly in the vehicles, construction, trade, distribution of fuel, household items. Textiles( so much so there want be a single marriage ceremony if we don’t get sarees from India). All Sri Lankans know how India had treated us even from prehistoric times. ​Starting from Rama in pre-historic times, and then from 2nd century BC downward with Sena- Guttika the horse traders, Elara. And the most devastative and destructive 12th century Magha invasion, that completely destroyed our Anuradhapura and Polnnaruwa civilization and force us to shift to the south West wilderness. (from which we have not been able to recover up to date) there had been continuous waves of Indian invasions by their unquenched greed to capture this Pearl of the Indian Ocean and finally the subversive invasion of the Kandyan Kingdom by Nayakkars after Vijaya Rajasingha was enthroned by conjugal conspiracy. Are these two men, JR and his nephew Ranil, the reincarnations of Don Juan Dharmapala of Kotte? The most important question before the whole nation and all those who are supposed to represent them in Parliament is, are they all going to allow Ranil and his UNpatriotic Government to commit another irreversible historic blunder to reduce this country to a regional vassal State of India as JR dreamt in 1930s. ​Are we going to remain deaf, dumb and blind again like a bunch of monkeys as they already did in 1987 while these treacherous politicians ruin our 2500 year old glorious nation?